for each of us is a gift you will cherish always." our sense of being in this world. Three cheers!!!" elevates the human spirit is something to behold." "At the keyboard, Jessica Roemischer creates cathedrals of sound, visible, tangible, not just audible. She is a true improviser, bravely venturing, her vistas unrestricted, but always honoring the melody and its harmonic richness...She leaves the listener enriched and delighted." "It's like you're saying to all the dark cynics of the world: 'Look! The light of Beauty shines in every single human being!'" "Since our music coaching session just a few days ago, I already feel differently about my time here at school. The students can sense it, too. There's more freedom between us, a more relaxed and deeper feeling. I'm listening to them differently--listening for the 'melody' that is present in them but not yet heard. I'm realizing how many more possibilities and connections there are with my students than I'm usually aware of!" 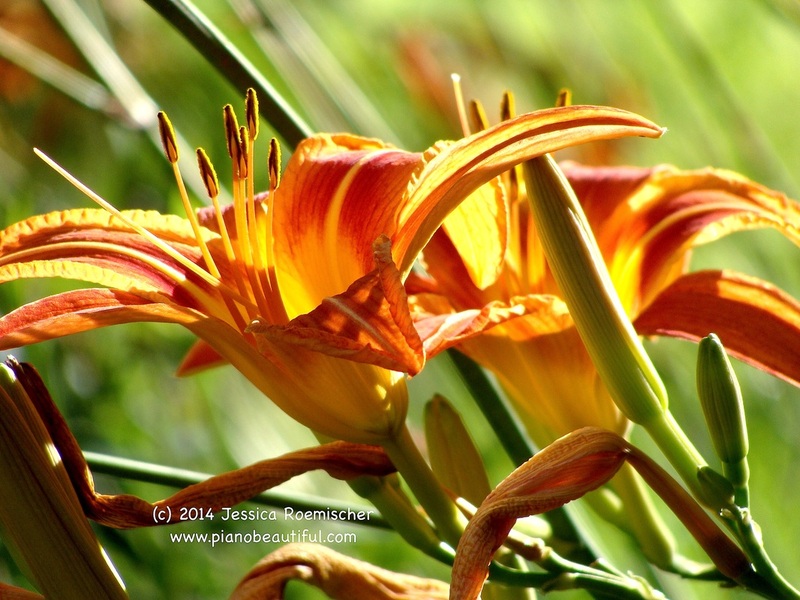 "Working with Jessica has helped to awaken an inner urge to create beauty through music. She works with the deepest part of a person to uncover and unleash their authentic potential and musical freedom. Jessica is expert in taking a person to that place." "Deepest thanks for offering us the gifts of your music, your generous, gracious spirit and, indeed, your very being. All were greatly enriched by your presence. I can't thank you enough!" "A rare Mozartean elegance and incredible fluidity. Jessica captivates with virtuosity and friendship." express themselves with such authenticity and elicit that quality from others." "Jessica Roemischer has created a unique path of awakening. Wonderful and inspiring!" "Your music is truly a gift of peace and comfort through our troubled times." "You're on the cutting edge of showing the world what is possible. The implications of what you're doing are profound!!!" "Your performance last night was divine. You are a shining light unto the world!" "When I get to heaven, I'm going to play like that." "Your rendition of "My Favorite Things" was greatly impressive, with a unique and creative interpretation, highly skillful musical conception, touching expression, and beautifully developed technique. It was a joy to listen to!" "It is so clear what you are onto here---nothing less than the realization of real beauty, real joy, real enduring humanity. You have poked a window from here to the other side--a way of seeing into truth where no fear can have sway." "Jessica Roemischer is a person you don't want to miss on "In The Spirit" radio. She radiates love and light. Great having you back!" "You truly made our retreat here in Canada a week to remember. You are so beautifully skilled at helping people release and heal, and we have come back home better able to cope and carry on with the lives we live. Thank you from the bottom of our hearts." "Playing in duet with you was transformational! I experienced what it was like to be a concert pianist. I'll never forget that feeling!" "For several days now, I have been wondering how to thank you for your awesome CD, "Haven'. At the 8am Mass, I heard psalm 51:12 'Create a new heart in me, O God,' as if I HEARD it for the first time. Your CD has had me thinking about what it means to truly listen. Perhaps for the first time in 70 years, my HEART was listening as psalm 51 was being read. I would like to give due credit to your wonderful CD; it is, I believe an answer to an unspoken prayer. When my car engine is running, your CD is ON, whether the trip is long or short. I find your music masterful, intriguing, and as St. Paul might say; 'good & true & beautiful.' Thank you very much for a precious gift that I have come to treasure." "Jessica combined a very developed and refined musical talent with an expansive and contextualizing perspective on the nourishing and healing power of music in our lives. And, as a wonderful bonus, she invited completely novice audience members to join her on the piano for an improvisational duet. We all were charmed by the astonishingly beautiful results." your event at St. Philip's was indescribable." "Your work is truly Full of Love, tenderness and the melody of the Heart." "Jessica Roemischer takes music off the keys and delivers it to a place that is none other than Love." "My heart was opened in the midst of improvising in duet with you. I want to live always that freely and openly and creatively." "Your workshop was a profound experience. The most impactful aspect for me was the alchemical field of 'doubtlessness' you create for your students. The magnanimity and generosity of creating that for another person is astounding." "The fundamental principle of your work--the belief that beauty is inherent in us all--is our best hope for healing/saving the planet." "Finally I had a chance to hear the recording of the duet we did together. Wow! I think for the first time in my life I could genuinely experience myself expressing who I am musically." "Your belief that beauty is a dimension of the human soul is so uplifting. I'm thankful that you are championing this worldview. The opportunity to improvise with you at the New York Integral workshop awakened the creative spirit within. What a gift! " "What a thing you are doing: opening doors for people to express their gifts where others saw no doors." Dave Lent, Filmmaker and Producer of "The Five Keys of Self Mastery"
"When I listen to your duets with your students, all I can say is that my heart sings. It takes me to another place, no matter my mood, and I start smiling quite involuntarily. The experience is a reminder of what it feels like to let the expression come from your deepest self." "Watching your piano duet videos was an unbelievable experience. It was like seeing Mozart playing through a child." you and your students is profound. Your contribution is truly spectacular!"